The image on this blog was not taken from the Google images that came out after I searched “Mayan Calendar 2012“. It is an actual photo of a Mayan calendar that I personally shot for this blog. We had the round calendar since 1978 and the story on how and why we had it for so long is what I will relate here. I actually do not even know how it’s called and only came to learn about the object when I googled “end of the world 2012” and noticed that the word “Mayan Calendar 2012” was prominently included in the results. 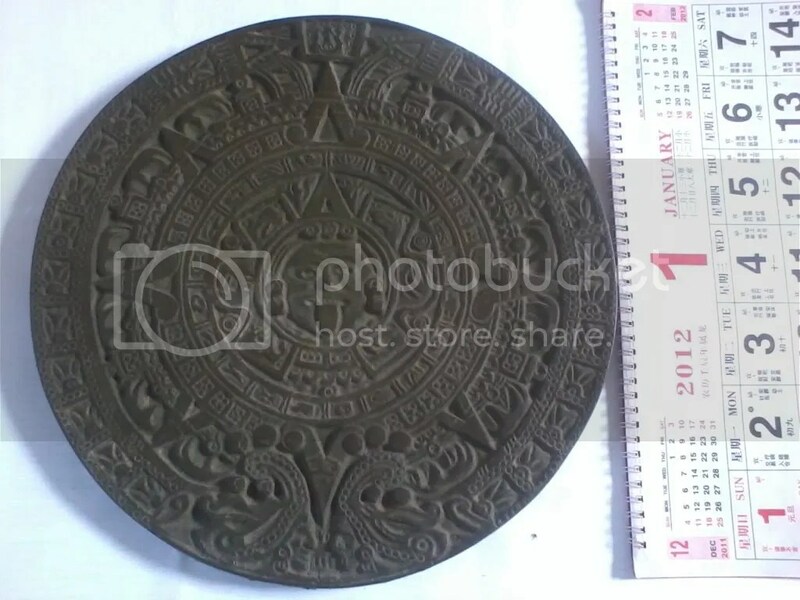 To complete my reading and small understanding of the subject, I made a Google image search for “Mayan Calendar 2012” and to my big surprise the search results showed images of an object that exactly the same as what we had for a long time as wall decor. The 20-day round calendar that we had since 1978 is made of fiberglass with bronze paint finish and was a Christmas gift given to me by a chemical supplier when I was managing a company that uses polyester resin on one of its products. Without even knowing what it was, my wife liked it and hung it on the walls of the three rented apartments where we lived and have it till now in our owned home. Some wall decors that we had like paintings and framed photos had come and go but the Mayan calendar remained with us. At present, when talks about the doomsday to happen when the Mayan calendar ends in December 21 (or 23), 2012 get louder each day, the frailty within me makes me wonder why the round calendar had stayed for so long with us. Will it save my family if the dire prediction occurs? If so, how? I definitely do not know the answer but one thing is sure, our faith in God will be our salvation. Whether December 21 is indeed the end of the world or not, only God knows. All we have to do is to wait on Him and continue to trust in the Lord. we’ve heard a lot about this end of the world and by the grace of God we’re still here. i don’t think any mayan calendar can surpass the power of God and the prayers of the righteous. and my pastor also said that doubt is sin. It’s okey, Maxx. I really don’t know anything about the thing that we had for so long a time. I just get excited when I so it in the web and being linked to Mayan calendar and the end of the world prediction. I really don’t care what it is. I don’t believe the world will end in December 2012, anyway. Thanks for the clarification.